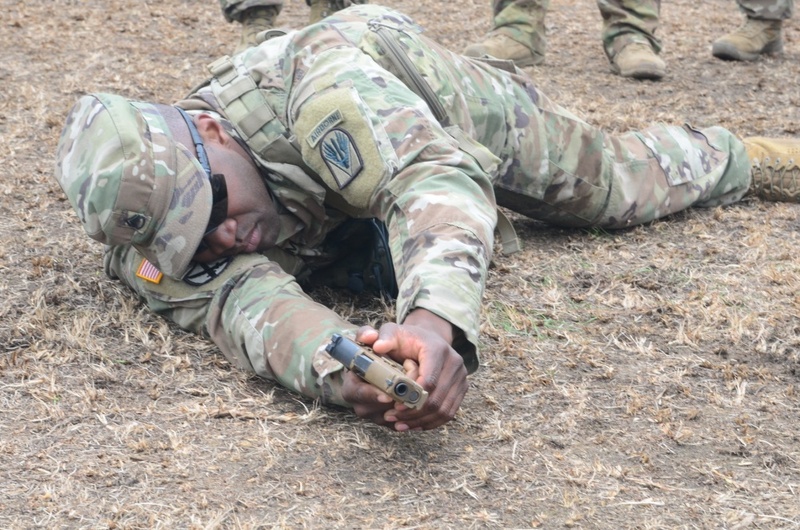 Soldiers from 1st Battalion, 1st Security Forces Assistance Brigade (1st SFAB) familiarized themselves and qualified with the XM17 handgun at the Joint Readiness Training Center (Fort Polk, Louisiana), January 19-20. According to the Army, the XM17 and XM18 handgun systems are replacing the M9 pistol. The «X» in «XM» stands for experimental and will be used until February 2018 when the weapons complete Type Classification. Afterwards, the weapons will be referred to as the M17 and M18. The XM18 is the compact version of the XM17. Both weapons are capable of firing 9-mm rounds. Army Major Lucas Leinberger, the chief range office from 3rd Battalion, 353th Armor Regiment, provided insight on the range and some of the fundamentals in basic marksmanship. «We are working with members of the 1st SFAB to get some familiarization with the M17 pistol», Leinberger said. «Part of that training is going through fundamentals such as sight picture, proper grip and trigger squeeze». The Army currently has plans to buy approximately 238,000 units of the new pistol system. «Personally, I noticed a better balance in the overall weapon – how it feels in your hand compared to the M9 and the M11 service pistol both unloaded and loaded with a full magazine», Leinberger said. «I believe it is much easier to use; it is more ergonomically correct. I believe it will make anyone who is firing the weapon more combat effective». The main reason for the change in weapon systems is to make the soldier and units more lethal. The XM17 and XM18 modular handgun system program is one of the first in what is expected to be a whole line of modernization efforts that the Army will pursue over the next few years, according to the Army. Army Sergeant Max Gilbert, a combat engineer with 2nd Battalion, 1st SFAB, has learned about the weapon and put his trust in it to make him more lethal in combat. «The instructors here at the range were professional», Gilbert said. «Yes, I feel that I am combat effective and combat ready». Army Major Brennan Speaks, brigade operations officer for 1st SFAB, provided his take on the XM17. «Overall it is a great pistol; I am extremely pleased with it», Speaks said. «I have fired over 500 rounds and not once did it jam or misfire. The fact that we are deploying and the Army has made their commitment to move these pistols to us, to me, says a lot about the Army’s commitment to the SFAB to ensure we have the best equipment to go overseas». SFABs allow the Army to reduce, over time, the demand for conventional brigade combat teams for combat advising. In this way, the service’s Brigade Combat Teams can focus on readiness for warfighting against near-peer threats.